Exciting new changes at GlassFrog! At GlassFrog we've been promising changes. Today the time has come for us to announce the new UI is ready to be used in beta! For any user interested, you can beta test the new UI by clicking on your name on the top right corner and selecting "Try new UI" of the drop down menu. You can always switch back to the current interface by clicking on your organization's name in the top left corner and selecting "Use classic UI" in the list. Click here to read more about this and feel free to share your feedback with the GlassFrog Team at support@glassfrog.com. Also, in case you missed it: for Glassfrog Premium users also using Slack, you can now make actions and projects requests from one role to another role, directly in Slack. If you were experiencing issues using this feature, we just fixed a small bug so re-installing the Slack integration on the Organization Settings page should now allow you to get the request functionality. If you had user group syncing enabled, don’t disable it in order to re-install the Slack integration (that would remove all of your synced user groups), but afterwards re-enable user group syncing to keep it working again. To learn how to make requests in Slack, check this article. We're happy to announce the Italian translation is now complete and live! If you're an admin, you can switch to the Italian language by going to your "Organization Settings". Check this article for more details. Currently GlassFrog is also available in Chinese, Dutch, English, French, German, Polish, and Spanish. Stay tuned! Next languages on their way: Hindustani and Portuguese. You might feel that something’s different in Governance meetings and while making Asynchronous proposals in GlassFrog. That’s because our team has largely rebuilt the entire proposal system. The vast majority of this functionality is behind-the-scenes, so you might not notice many visible changes; however it will provide a much smoother user experience in some of GlassFrog's core functionality. Also, for GlassFrog Premium users, if you have a Premium account with Slack, you can now enable a new feature that will allow you to tag roles in Slack and automatically notify all of the individuals filling that role. GlassFrog administrators can set this by syncing your Slack team’s user groups with GlassFrog roles and role-fillers. See more details and follow these instructions. Habit Support Program completed in Polish! Habit Support Program is now available in Polish for GlassFrog Premium members! Click here to know how to enable the Habit Support for your account. Click here to see what's your preferred language URL. Habit Support Program is also available in English and French. German is coming soon! We are very excited to announce that GlassFrog is now translated into main land Chinese!!! For info on how to change languages in GlassFrog, check out this article. More languages are on the way - Italian should be next! If you are an OmniFocus user, now you can sync with GlassFrog in public beta! Projects and actions you add to GlassFrog will automatically populate your OmniFocus folders (and vice versa) making for a seamless weekly review experience. If you want to participate, please read these instructions before installing the OmniFocus sync app and check this article to find answers to common questions regarding the tool in beta. Try it out and let us know what you think at support@glassfrog.com. Habit Support Program now in French! For GlassFrog Premium account holders, our Holacracy complete Habit Support Program is now available in French! Polish and German translations are in progress and should be completed soon! If you’re an Admin and want to turn on the Habit Support Program for the entire organization, check this article. To see how to enable the Habit Support Program for your account, click here. We now have GlassFrog translated into Spanish! Currently GlassFrog is also available in Dutch, English, French, German, and Polish. More languages are on the way - Chinese is next on our list. You can now add all your tensions into our new Inbox feature. Once you're ready to process, these tensions can be turned into Projects, Actions, or Agenda Items to bring to Tactical or Governance meetings. For more info, check out this article and this one. Browsing through your projects is now easier with the project menu. On the left-hand side of the Projects page, you can now browse through your circles, roles and projects. We will be performing server maintenance on Friday, March 2nd from 7-9pm PST. During this time, GlassFrog will be unavailable, though we will be working hard to get it back online as quickly as possible. Please contact us if you have any questions! Want specific people to be able to see your GlassFrog organization without making it public to everyone? Starting this January - GlassFrog premium organizations will not be charged for non-participating members. For the full criteria we use to automatically classify such accounts, see this article. New to GlassFrog or rolling out a Holacracy implementation to a new division of your company? Add all those users at once by using the bulk user import feature. GlassFrog Premium users will find their circle's asynchronous governance proposals in a new location - look for them under the bell icon. For those of you still working this holiday season we have some treats for you! Explore this article to learn how to add add actions to your projects -- as well how to link existing projects on the Actions page. Check out the new Reports menu and this article. Now both premium and free subscribers can share their Holacracy-powered organization structure with others. For more information check out this article on how your GlassFrog Admin can make your organization public. With tags, GlassFrog Premium users can give more context to roles and people. Example uses include skills, badges and focus time. To get started, visit a role or person's page and click "Add Tag". For more info, check out articles on adding tags to roles and people. With our new iOS app, users can view org information, log tensions, and view facilitation guides. Click here to download it from the iOS app store, and click here to explore the FAQ. With our new Actions feature, you can now track actions assigned to you during tactical meetings, as well as add your own by clicking the Actions tab. For more info, click here. Single Sign-On (SSO) allows (Premium) GlassFrog users to log in using their existing SAML authentication (e.g. Active Directory, OneLogin, and Okta). This means they no longer have to manage another set of usernames and passwords. It also streamlines account provisioning. For more information on how to configure SSO, click here. We now have GlassFrog translated into Dutch. With our new Slack integration (Premium Plan only), Secretaries can now automatically send asynchronous Governance proposals for their circles to a Slack channel of their choice. Members can then review the proposal and select No Objection or Bring to Meeting right from Slack. To enable, simply go to Admin > Organization Settings, and click Enable next to Slack. More info here. Once enabled, Secretaries can turn on the Slack integration for their circles, and members can choose to disable email notifications for asynchronous Governance proposals. We now have GlassFrog translated into German. More languages are on the way - Dutch is next on our list. What used to be an exclusive program for our implementation clients is now available to all our Premium GlassFrog users. Once turned on, you'll receive an email every few days to help build the habits and skills you need to get the most out of your Holacracy practice. You can also pause or unsubscribe at any time. For more info on how to enable Habit Support, check out the following FAQ. Wondering who's in GlassFrog following along during Tactical and Governance meetings? Now you can see the profile pictures of attendees in the navigation bar. Ever need to switch secretaries during a Governance meeting? This can also be useful when participants would like to type their own proposals when they're complex. Note: Secretary functionalities are already available for everyone during Tactical meetings, so there's no need for the "Take over as Host" option there. For minor and multi-filled roles, we now have an indicator showing who's excluded from meetings. Try our new Live Chat Support Feature! Still in beta and available to premium GlassFrog users, connect with GlassFrog Customer Support live using the chat window visible in the bottom right corner of your screen when you're logged into GlassFrog. GlassFrog has been translated into French with more languages on the way - German and Dutch are at the top of our list. Learn how to switch languages here. Need GlassFrog in your language? Want to help translate? The GlassFrog Team chooses new languages based on demand and assistance available. Email us at support@glassfrog.com. New GlassFrog user interface is live! This has been coming for a long time and we're getting a lot of questions about what motivated us to make such a big change. The answer is that GlassFrog's styling had been with us for a long time and the libraries were becoming out of date. We wanted to switch the look to something more clean and modern, and prepare for more functionality and responsiveness, especially with mobile devices. The switch to these more modern style libraries will make it much easier to quickly make visual changes to the site. Our developers now have more fluid ability to tweak layouts and improve the overall look and feel. You can expect to see GlassFrog growing in new directions now that our frameworks has been upgraded. Send us your feedback at support@glassfrog.com! GlassFrog is getting a new look! In the coming days expect to see a big change to GlassFrog’s look and feel. We’re delivering an improved layout and font selection as well as many minor usability improvements. Most of the changes are subtle and we’ve put a lot of effort into ensuring that all of your favorite features will still be easy to find. Nothing has been removed although some widgets and links have had their positions adjusted. If you have trouble finding a particular feature please don’t hesitate to email support@glassfrog.com. For more see: What will the styling changes look like? We’re double checking our nouns and triple checking our verbs as we prepare to deliver GlassFrog in French. Special thanks to iGi partners for their help with our beta test! If you would like to volunteer to assist in upcoming translations for your language of choice, contact GlassFrog customer support and we’ll add you to the list. - Removed a display problem with role names that include ampersands (&) in tactical meeting projects. - Fixed an erroneous translation error message on tactical meeting agenda box. - Fixed some lingering display issues with policy text. - GlassFrog credit card receipts now correctly include organization number and name. GlassFrog administrators now have the ability to edit the name of their organization. More info here. We’ve made more progress on GlassFrog internationalization and translation features. Beta testing for GlassFrog translations will start soon! Email support@glassfrog.com to volunteer as a proofreader or translator. Asynchronous proposals that were escalated to a meeting can now be reproposed. This is accomplished on the proposal screen. Click the "proposals" link next to the search box to access. Escalated proposals will still have a "Propose Now" option available. In this release, the GlassFrog team has added some new ways to email and export users. Administrators can now access mailing lists for Lead Links, Facilitators, Secretaries, Rep Links and all circle members. More info here. We've put in more of the background work required to prepare GlassFrog for translation into other languages. We are still accepting translation volunteers. If you would like to help us get GlassFrog translated into your language, email support@glassfrog.com and let us know. Include a link to your organization and the language or languages you speak fluently and we'll contact you when the time comes. A proposal badge indicator has been added to notify you when there are new proposals. This will appear next to the "Proposals" link at the top of GlassFrog when there are new proposals to review. We've added the ability to add custom sections to any Circle Page. Go to any of your Circle Pages, hover over the left blue sidebar and notice the gear icon that appears. Click to reveal a new screen that allows you to add new sections to your Circle Page. We changed the way Glassfrog loads resources in your browser and initial page loads are now much faster. Users in Australia are seeing pages load twice as fast! In the US, the benefit is around 100ms or so on the first page load. Did you notice? The overall speed and reliability of Glassfrog are two of our top priorities. You may have noticed that our sign in page has changed. You now have the option to sign in with your Google account. Just click the [Sign in with Google] button on the main log in page (You may need to sign out to see it if you haven't lately). This will link your Glassfrog account to your Google account and make signing in quick and easy. One fewer password to remember! As of Jan 1, we’re offering two pricing plans: a Free version with all the basic features needed to get started and practice Holacracy, and a Premium version with a richer feature set to enhance the efficiency and effectiveness of your Holacracy practice. The Free version can be used by anyone at any organization size, with unlimited users and circles. We are setting pricing for the Premium version using a simple per-user model, similar to other team productivity tools, and pricing it at $9/user/month. We created the Free version because we want to support the Holacracy community and ensure anyone practicing Holacracy has access to the essential tools to do so, regardless of budget. This is part of an overall initiative to offer a core toolset for implementing Holacracy at no cost, including the Quickstart Guide and various resources available on our website. The pay-per-user model for Premium is a response to feedback from paying members to create a simplified version that's easier to calculate and predict, and pricing doesn't change as you add and remove circles through the Governance process. For transparency, we estimate our overall revenue from GlassFrog as a result of this change will be neutral to slightly negative--this is not intended as a pricing model increase, although some clients will pay more and some less under this new formula. - Why is Glassfrog offering a totally free option? You can now view the history of role assignments from a role page. Just click on the role name from the circle page "Roles" tab to visit the role page. In the upper right corner, you will see all of the role fillers for the role, and there is now a "History" link that will take you to a new page listing the history of assignments for that role. Note that this history is not yet available for the elected roles of Facilitator, Rep Link, or Secretary. Secretaries can now help Lead Links with the administrative task of assigning and unassigning people to roles. As a circle secretary, You can assign roles either by dragging circle members from the circle member table into the role, or via the role assignments icon to the right of the role on the role tab. Lead Links and Secretaries of your organization's anchor circle can now configure it by clicking on the gear icon next to the circle name on the anchor circle page. You can now see when the election term expires for a circle Secretary, Facilitator, or Rep Link on the circle page (in the Core Roles section). You can now send proposals outside of meetings via GlassFrog. Craft a proposal using My Tensions, and submit it for review. Circle members will receive an automatic email notification to review the proposal, and can either say no objection or request that a submitted proposal be proposed in a meeting. If there are no objections, the proposal will be adopted automatically and circle members are notified via email. Secretaries do not have to do anything. To use this feature, propose a policy to accept proposals after a number of days, or your proposals will just remain unaccepted unless everyone accepts the proposal. - Click My Tensions (found via blue navigation bar across the top), craft a proposal, and submit it or save for later. - Click submit, and confirm. Circle members are emailed about the proposal. - When viewing My Tensions, submitted proposals indicate they are being processed instead of just a draft. See the number of responses, and view the proposal. - If a proposal is escalated to a meeting for processing, the proposer will be notified with an email. You can't re-submit after it is escalated. - To stop the circle from processing a proposal, add it to the agenda from your My Tensions list during an open Governance meeting. - If a proposal is submitted that includes editing governance records that are in conflict because other proposals have been processed, GlassFrog will email the proposer and not process further. Proposers can add to agenda during an open Governance meeting to process further. - Click Review Proposal to access a proposal in GlassFrog. Review the proposal, and click accept or escalate to a meeting. - If there are a number of days after which the prospoal would be automatically accepted, that time will be displayed. - GlassFrog will indicate if someone has requested that a proposal come to a meeting. - On the "roles page" or circle page enter the time to auto accept Governance proposals via a gear icon to the right of the circle name. - Admins, Lead Links, and circle Secretaries can edit the time to auto accept proposals and the circle's nickname. The My tensions and proposal builder feature has been available for a few months, but here is how to use it if you are new or want some guidance. When you have a tension for governance, add it to your My Tensions list (found in the blue navigation bar next to My Projects). Type as little or as much as you need for each tension. Save the tension. There is also an option as a tactical output called Tension to capture governance tensions. Here you can also add an agenda item, the tension, circle, and a proposal if you want. Edit the proposal later to be prepared before the meeting. The benefit of this is that you have a way of both tracking tensions and starting proposals outside of meetings. Create draft proposals with multiple parts, just like Secretary does during the Governance meeting. Your proposal will be available to select for the next Governance agenda, but you don’t have to add it to the list if you aren’t ready. When there is a Governance meeting open, click Join Governance meeting to be able to add your tensions to the agenda. Then click the ‘choose from tensions' link right below where you enter agenda items to add your tension to the list. You get a pop up of agenda items / tensions, and you click to add it to the agenda. When Secretary selects your agenda item, those watching via ‘Join Governance’ link will see the proposal, just like when it is entered by Secretary. When you click on the agenda item that was added from someone’s My Tensions list pre-populated proposals automatically load in GlassFrog. Edits to any parts of the proposal made before clicking Accept Proposal are saved (so the originally pre-populated proposal is changed if you change or remove anything. Once Secretary clicks accept proposal then the agenda item can be 'checked off'. Now GlassFrog adds your initials when you add agenda items during a meeting. If you type a dash '-' and your initials, then that overrides the initials GlassFrog displays. For Secretaries, if you are adding an agenda item for someone else, type the item, followed by a dash and the initials of the agenda item owner. Then Facilitator can know immediately who owns each item. "My Authority" page, linked from the nav-bar. Try the role selector showing 'My Roles', and select one of your roles to see constraints on authority in the role. View domains and policies that you may need to consider, and find helpful Holacracy tips as you scroll to the bottom. Simple core role definitions are now in GlassFrog. They are a summary of the constitutional definition. See the constitution for the full definitions, but the definitions in GlassFrog (found by clicking the word Secretary, Facilitator, Lead Link, or Rep Link on any roles page) are intended to mean the same thing. Agenda items can now be unchecked in a Governance meeting. Secretary should still click the agenda item label when facilitator is ready to process that agenda item. The agenda items are automatically checked when you click accept proposal, but you can click the agenda label to 'uncheck' the item if needed. As always, contact us with any questions or feedback via our webform. Projects can now be sorted by business value to the organization. Simply open up a project and fill in the business value estimate (value) and the effort to complete the project (effort), and GlassFrog will calculate the Return on Investment (ROI) for that project. We recommend using 'unitless' or 'relative' numbers for value and effort estimates. In other words, 2 being twice the value of 1, and twice the effort of 1. Lead Links typically enter the Value (with input if desired) and the role filler / project owner typically enter the effort. Recommended options are: 0, 1, 2, 3, 5, 8, or 13 for each. Save the project, and GlassFrog will show the ROI value on the project, and will sort projects with higher ROIs and values to the top of the project board so that you can see which projects are more valuable to your organization. Or, if you want to enter the value for now and enter the effort later, GlassFrog will show the value on the project and include that when sorting. Role fillers can then prioritize their work based on these ROIs or just the Business Value Estimate, or Lead Link can specify prioritizing by highest Business Value or ROI if that is available. We've happy to announce that we're introducing a new version of the API (v3), and we're ready to begin public testing! API v3 is in beta- we expect to be adding and potentially changing functionality in the weeks and months ahead. You can get more details about the v3 API on the documentation page. We have two new big pieces of functionality. Actions and triggers can be private to circle. They will be displayed in your tactical meeting history if you do not make them private. Follow or unfollow circles other than your own to receive tactical and governance meeting emails. Manage your subscription page to choose whether you want tactical and/or governance emails for the circles you follow. View actions and projects in a tactical meeting history for your circles and other circles. You can now view actions and projects in a tactical meeting history. The default for actions prior to January 31 is 'private to circle'. Click the History tab on your circle page and scroll down below the Governance history to view Tactical history. Now you can select private to circle for any action, trigger, or project that is created during a tactical meeting. The default is that any outputs are viewable by anyone in the organization, so all outputs will show up in the tactical meeting history if they are not saved as private. Click the lock icon in the output field to make an action, trigger, or project private to circle. Note: for companies with information set to publicly viewable, actions and triggers are by default not publicly viewable, but projects are. Non-circle members can follow circles and receive Tactical and Governance meeting emails, and unsubscribe from them later. You cannot unsubscribe from circles in which you fill roles. If actions or projects are marked as private to circle, then those won't show up in Tactical Meeting emails to non circle members (who are following that circle). Find your subscriptions by hovering your mouse over the drop down menu next to your name to the left of What's New in the upper right part of your screen. Uncheck boxes to edit your preferences, such as if you'd like to receive only Tactical or Governance meeting emails in the circles that you follow. Role info in the org chart and more! There is role data in the org chart, which will is informative when you are clicking and zooming in to see what roles are in a circle. When you zoom to a role, you can see the role definition (it scrolls if there are a lot of accountabilities) and the Gravatar of the person who fills the role. I'm excited to announce that last week's release included a much needed update to the org chart. The new visualization of an organization is now more aligned with a Holacracy structure. The circle structure view also now works much better for larger organizations. Click around to explore HolacracyOne's circle structure! Mouse over a circle/role to see the name appear, or to zoom in/zoom out. You'll see the circle selected by the border changing color when you mouse over, and then click to zoom in or out. Zoom in to see labels of sub circles more than three layers deep. Internet Explorer is not recommended for best results. You can still use the org chart and navigate to a circle by clicking on the (hyperlinked) circle name. Or use the search function to find a circle and click through in the search results. To navigate to a circle page, click the circle name displayed as a hyper link in the circle. More circle names will appear if you zoom in. Colors show roles that are filled, unfilled, core roles, or roles that do not have an accountability or a purpose. There are more plans for enhancing the org chart, but this is a big step forward for now! If you have any issues with the circle structure, want to give us feedback, or have questions, contact GlassFrog Customer Support! We've fixed some bugs and added a scratch pad for Governance meetings. The scratch pad is located below the agenda in an open governance meeting. Secretary can capture starting proposals that are not clearly a Role or a Policy. The text is not saved, as it is just a temporary note pad. Secretary can also chart objections here for the Facilitator. When editing a role that is a Subcircle, if Remove Role is selected, then the default selection is Destroy the Role Entirely. If you want to retain any policies or keep the circle as a role, select the relevant options after selecting Remove this Circle. Contact GlassFrog Customer Support via the Contact Us form with any questions or bug reports. When creating proposals, there are fewer menu options for more intuitive navigation and viewing. Create or edit roles in the left column, or create or edit policies in the right column. Agenda: Secretary can type the agenda item into the agenda field in the left column. Press enter/return to save the agenda item. Like the Tactical Meeting agenda, click the check mark to complete the item or click the x to delete the item. Screenshare during a virtual meeting or use a projector to show the agenda and proposal. Working with Roles: To create, edit, or remove a role or a circle, mouse over the Add/Edit role menu and click on either New Role/Circle or select the existing role by clicking on it. When editing a role, at the bottom of the accountabilities find two options to either expand the role to a circle or else remove the role. Multi-part proposals: Add parts to a proposal by clicking the green menu bar labeled Add Part at the bottom of the screen. View parts by scrolling down. Contact GlassFrog Customer Support with any feedback or questions. Role foci appear in search results. 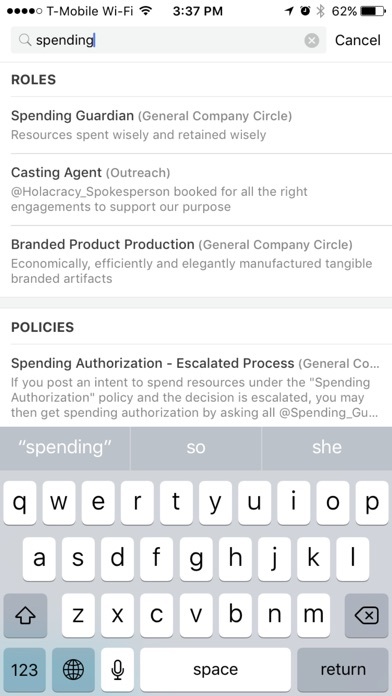 Searching for Governance information will now return the role focus. This is for checklists and role notes like processes. On the role page, scroll down to see Published Information (see below). Type the title in the field. Insert a link into the field, or type text. Use html tags if necessary. Add more or edit existing notes as you need. Now the list is automatically generated per Constitution 4.0. Circle Members removed from all role assignments in the circle will be automatically removed from this list. Lead Link, Secretary, or Admins can add people as extra circle members even if they don't fill a role in the circle, and later remove them (or see them automatically removed if later they are assigned to a circle role and then the role assignment is removed). If a circle member was added manually and needs to be removed, click the "x" to the right of the name in the circle member list. Earlier in the week there was also a deployment to fix a bug causing Rep Links not to display or behave properly. Contact GlassFrog Customer Support with any questions or issues. In Tactical Meetings, during Triage Issues, you now have the option to capture a 'Trigger' in addition to other actions and projects. Triggers are actions that need to happen after an event or date. For example, you could have a trigger to Tell Trainer the venue details after the venue is confirmed. Secretary would first enter the action, and then the triggering event or date. Both fields are labeled. The trigger gets assigned to a role, just like other actions and projects. We deployed a few bug fixes and have some new functionality in both the Tactical and Governance interfaces. In a Tactical Meeting during Triage Issues, drop down menus are now (reversed) in the order of Role, and then who it is Assigned To (person). Hopefully this will be more intuitive. Recently we did a handful of bug fixes that hopefully weren't too problematic for most users, but should make adding and editing policies, assigning roles, removing a sub circle, and configuring your anchor circle go a lot smoother! Thanks everyone for reporting issues, as it helps us in our efforts to improve GlassFrog. New functionality includes a minor update and a bigger one. New: Configure your Anchor Circle. Click here for the YouTube video for users who have not started using GlassFrog. New users can just rename their Board to what their Anchor Circle is called. Click the Edit icon immediately to the right of the Board header on the circle/roles page, found by clicking the Board Circle in your new organization. Type the Name, Short Name (if you wish), Purpose, and Lead Link (there will be a drop down to select the Lead Link). You are ready to go. Click here for a video walk through of this. If you are using your Board, you can keep using it or rename it as described above, as needed. If your GCC is really your Anchor Circle, and you don't use your Board, then you can delete it. Use caution, as you cannot currently create a new anchor circle if you decide you need to insert a new Anchor Circle (that will be some months from now based on our current prioritization. Select General *Please note: Record your 'Alignment Circle' strategy elsewhere before clicking Accept if you'd like to retain this in your 'new' Anchor Circle. Either keep as a role or remove entirely. I will remove entirely. Select all the roles and policies to retain in your Anchor Circle There is no way to easily select all; you must check each one that you want to keep. Then Configure Board to be your Anchor Circle by renaming, updating Purpose, and adding former GCC Lead Link, as described above and in the video. Circle Policies view, ability to add and edit Role Policies for your Roles with a Domain, and pasting a Role definition. Contact Customer Support with any questions or issues. When you view a Circle page, Policies are now organized by Domain (see below, or visit this link for a live example). There are no longer categories. When you create a Policy for the Circle during a Governance Meeting, you still select a Domain. See this post for more on creating Policies and selecting Domains. If your Role has a Domain, you can store your Policy in GlassFrog to control the Domain. If there is a Domain, an icon to add a new Policy appears immediately to the right of the Domain. 2. Enter a title and the Policy. Use role-linking/cross-referencing if applicable. Click Save. After you click the link, you will see the Policies. When creating or updating a Role in a Governance Meeting, you can now paste Role definition parts. If you've emailed a Proposal to the Secretary, it will be easier to enter. Below, a Domain was added, as well as two Accountabilities during a Proposal that Updated the existing Finance Role. Follow the instructions and label all lines that are not Accountabilities. (You may label each Accountablity too, but that is not needed.) Paste each part on a separate line. When you click Submit, the definition will be added to the Role you are updating (or creating). Clicking Submit does not save the Proposal to the Governance records; you still need to click Accept Proposal if you want to capture it for the Governance records. When the output field is selected during "Triage issues" in a tactical meeting, pressing Enter will now no longer close the meeting. This was happening sometimes, and you won't be able to accidentally close the meeting this way now. Links in emails are working again. If you are a Lead Link and get an email stating that there are unassigned roles to fill, if you are logged in, the link in the email takes you to the circle page where you can add people to the roles. Project create date. When you create a project, GlassFrog will store the date. When you click the name of any project to open the pop up (as if you to edit it) and view the create date immediately above the "Update" button. Eventually more dates will be stored, such as when the status changes. Type the text of what you are waiting on in the For What. Click Update to save your changes. When in a governance meeting or taking Secretary perogative, use the Update Policy button to associate existing policies witha scope. Now you can archive your done projects to make them disappear from the project tab but stay in the database. Eventually, these will be findable via expanded operational data support, such as a Tactical Meeting History. If you'd like to actually delete a project, then you can still do that, but this is generally not advisable unless you want it to be gone forever (see below). Click the check mark when you complete your project to update the status to "Done"
At the appropriate time (either when you complete it or after you report on it a final time perhaps), click the folder icon that appears on the top of completed projects. For now, what you will see is that the project no longer is visible on the project tab. Decide a project needs to be destroyed rather than completed? Remove it from the project tab by clicking on the project card (see below). Click OK when asked if you are sure (if you ARE sure!). by Role), and change the status. Click on the project card you want to move. Drag the card to any where in the the desired column/status. Release the mouse when the card is in the new status column. Users are now guided through the entire Tactical meeting process within GlassFrog to help circles easily practice and learn the process. Secretary can open the meeting and the series of steps are displayed at the top from Check-In to Closing Round, and the corresponding tab will be displayed. Click the green button to get to the next step. For example, after the checklist review, click Metrics to move to Metrics and display Metrics information. During triage issues, enter agenda items one by one and hit enter after each one. Then click the check mark to complete it. Read the agenda announcement for more information and an image. Tag role names within policies or role definition fields. Try out the new feature to link roles in accountabilities, purpose, and scope as appropriate. When creating a proposal, type the @ symbol followed by the role name, and you will get a drop down menu of options. Click the desired role and keep typing. If this cross-referencing feature is used, when the role name changes, the field referencing the role will automatically update. Additionally, if a proposal includes removing a role that is cross-referenced, GlassFrog will suggest specific objections to address the conflict. Users can customize the look of the projects tab. Click the gear icon in the upper right corner of the projects tab to display the options. 1)Show all/Hide empty to display either all rows or only those that contain projects. 2)Group by person or by role to organize the projects depending on your preference or needs. By person may work well for tactical meetings, and by role may be more useful in other cases. 3)View as rows or grid to quickly show all current, waiting, done, or future, while still keeping the data of what role or person owns the project. To close the settings, click the gear shape a second time. Circle members may open a Tactical or Governance meeting without the Secretary via the large button icons located above the Projects tab. This is to allow circles to meet when the Secretary is absent. See Section 2.7.4 in the Constution v 3.0 for the protocol on Surrogates for Elected Roles. For role fillers with no projects, the default view is that the role name is hidden and thus does not display on the Projects tab. To 'show all" circle members to add a project, click the Show all link in the upper right corner of the Projects tab. When Opening a Tactical Meeting, users can now capture agenda items within the left sidebar of GlassFrog. The first item entered will appear at the top of the list. The Secretary can enter items one by one and hit enter after each item to build the agenda. Click the check mark to the left of the item when it is completed, or click the “x” to the right of the item to delete it. Capture actions and projects as needed in the main column to the right of the agenda, and add items at any time to the agenda list. Email the Account Manager or submit questions via the webform if you need support. We have launched help text intended to support users even more to practice Holacracy when using GlassFrog. When viewing a circle, within the left column users can see definitions as mouse-over tooltips on small question mark icons directly to the right of key terms such as Purpose, Strategy, Scope, and Accountabilities. If you have any questions, let us know via the webform or by contacting your GlassFrog Account Manager! You should now be able to easily assign a different project status by clicking on an icon in the upper left corner of each project card within the projects tab. With the check mark you can select status to done; select current with the green circle, select waiting with the red square, and select future with the hour glass. If you have any questions, contact the GlassFrog Account Manager directly or use the webform. As a result of this evening's update, you will now notice some differences in the overall visual appearance, including cleaner formatting when viewing the tabs in your circle. You'll also notice an indicator for project statuses, which will add more clarity for project tracking and weekly updates in tactical meetings. In addition to this visual indicator, you can select a status when adding a new project to the project tab. Clicking on a project name already captured will also allow you to choose Done, Current, Waiting, or Future. Other changes are in the works and planned for the near future, and I will let you know as they arrive! If you have any questions or comments, use the webform or contact me in my Account Manager role. Enjoy these improvements, and let me know if you have any questions! You may notice that GlassFrog looks a little different. As of yesterday evening, GlassFrog now appears in widescreen, which will support easier usage and reading. To experience the full effect, you may need to clear your cache. Hold the shift key and click refresh to do this. With any questions or issues, please contact us via our support form, and we will respond promptly. As the next step in our plans for supporting the use of GlassFrog as a Corkboard, Organizations can now use GlassFrog for the Tactical Meeting Checklist Review. The Checklist tab is next to the Metrics tab. The available frequency options are weekly, monthly, and quarterly, and there is an optional field for a link for additional visibility. Checklist items can be associated with one role or all roles in a circle. Contact GlassFrog support with any issues or questions. GlassFrog now supports metrics. You can find the Metrics tab next to the Projects tab within your circle. Click the "+" button to add a metric, where you can add a description, role, and frequency. Optionally, users can add a link to where the metrics are stored for more detail. For assistance, click here to use our webform. You're about to see, if you haven't already, what we're so excited about: our GlassFrog production update has just deployed. In addition to the new look and extended information available from each Circle page, GlassFrog now bakes in support for Tactical as well as Governance meetings. We wish you well in your practice of Holacracy, which we expect will benefit from these new features. Feel free to contact us with any questions as we continue to develop GlassFrog! Last night's anticipated update was delayed; everything is ready to go on our side and our current re-target is sometime today. We'll announce further details here and on Twitter as they become available. You might notice some brief downtime tonight starting around 9 pm Eastern, when we're scheduled to deploy a major update to GlassFrog that will rearrange the look and feel of each Circle's page into a tab-oriented view. We're also very excited to be adding GlassFrog support for Tactical Meetings, including a project corkboard. Among other things, you'll soon see a new Circle view, a "Projects" tab, and a new "Open Meeting: Tactical" button. Support for metrics and checklists will appear in future updates. For user support and guidance to ease adoption and catalyze benefits from this exciting new functionality, just contact us with any questions. GlassFrog has a production update scheduled for this Friday, June 29th at 9pm ET which may involve some brief downtime. What's up with GlassFrog? Follow us on Twitter for the latest news & status updates. GlassFrog is scheduled for maintenance on Tuesday, June 5th between 10 pm and 12 midnight EDT (the actual time is likely to be only 1 hour or so, somewhere in that block). 1) Working with Sub-Circles: You can now work with sub-circles in a governance meeting, including moving roles and policies from your circle into a newly-created sub-circle, and re-absorbing roles and policies from a removed sub-circle back into your circle. Creating a sub-circle can happen from scratch (for a totally new sub-circle), or you can expand an existing role into a full sub-circle. You'll see the new buttons to work with sub-circles within GlassFrog's governance meeting interface. 2) Working with Cross-Links: Version 3.0 of the Holacracy Constitution added the ability to authorize one sub-circle to appoint one of its roles as a cross-link into another sub-circle (see the Holacracy Constitution for details). This is now supported in GlassFrog, via a new act in a governance meeting to "Authorize a Cross-Link". Use this to either authorize a cross-link (by selecting a sub-circle from the resulting drop-down), or to specify a specific role to act as the cross-link (by selecting a role from the resulting drop-down). You'll see a cross-link role automatically show-up in the target circle's role list. Looking forward, the GlassFrog development team here at HolacracyOne is now hard at work adding support for Holacracy's operational constructs. We'll announce updates as soon as they're available, and please do let us know if you have any questions or feedback in the meantime. We've just added search functionality to GlassFrog, in addition to fixing several formatting and usability-related issues. You'll see the new search box in the nav-bar on most pages - try it out and send us any feedback or suggestions! Hi Folks - We'll soon launch an update to GlassFrog™ which will enhance a circle's core roles: Facilitator, Secretary, Lead Link, and Rep Link. Once this update goes live, you'll see the definition (Purpose, Scope, and Accountabilities) of each of these roles listed in the system, just like you do with other roles. The definitions all come from the latest version (v3.0) of the Holacracy™ Constitution; for those still using Holacracy™ v2.x, this shouldn't create much trouble as the definitions are very similar. Once this update is deployed, you'll also be able to add Accountabilities and Scope within a governance meeting to the Facilitator, Secretary, or Rep Link, and edit or remove anything you've added; the system will not support adding to the Lead Link role, as v3.0 of the Constitution does not allow this (you should create another role instead to differentiate functions from the Lead Link, even if it's then assigned to the same person). We're pleased to announce that we've just launched several improvements to GlassFrog™, including this announcement system to keep you informed of future updates. Today's update included a major redesign of the governance capture interface (used by the Secretary during a meeting), as well as several bug fixes, tweaks, and minor improvements, which we hope will improve both the aesthetics and usability. Please contact us if you have any questions, feedback, or suggestions for future improvements.